Teams of 4 have to score as many points as they can in the time allowed which is 2 hours. Navigate to checkpoints (numbered circles on the map) and record the code or answer the question (on the provided scorecard) to prove you have been to that checkpoint. Navigation is easy with no compass needed. If students can read a street map or similar then they should be fine. Complete the various sustainability activities which are marked (with a letter) on the map at various locations. The activity superviser (a ranger or various external partners) will give you instructions on how to complete the activity and you must complete the activity to score the points. The activity supervisor will score and record your points. Everything is optional so teams decide how many activities they will complete or navigational checkpoints they will visit and in what order. That’s part of the strategy! 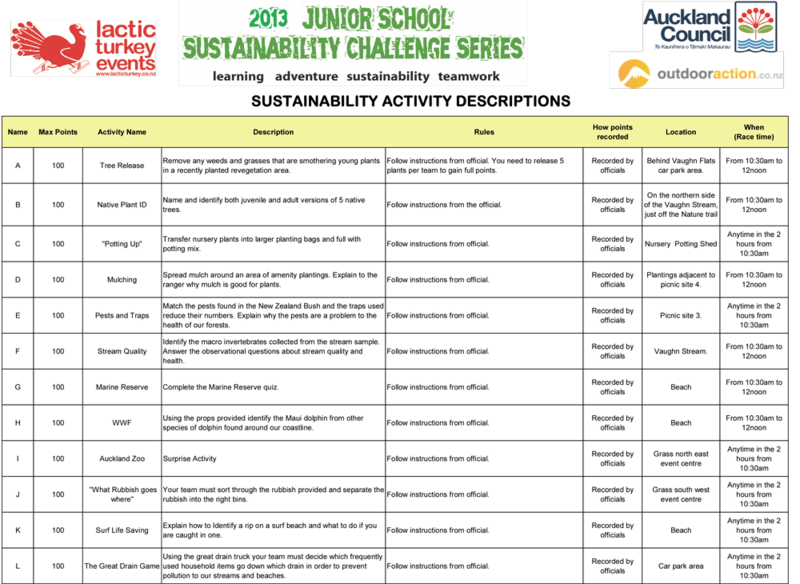 A week before the event we’ll send out some research/homework for teams to complete which may provide useful things for the kids to study in order for them to do the sustainability challenges faster or score bonus points. Registration is from 9am at the event headquarters. Before receiving your maps at registration we will need the completed Team Participant Declaration Form (1 for each team) and the Auckland Council Photographic Permission Form (one from each student or family). You then have planning time between when you register and start at 10am. Teams should read all the information and plan what activities they are going to do and which navigational checkpoints they plan to visit. 9.45am. we’ll have a compulsory race briefing where we’ll brief you on some basics on how the event works, health and safety, rules and anything else that needs covering. 12noon. Finish – don’t be late or you’ll lose some of your hard-earned points! About 30mins after the finish once we have input the scores into the computer and tallied everything up, we have a prize giving with a few merit prizes for the top teams and a range of small spot prizes drawn randomly. If you can please ensure that students have appropriate footwear and clothing for the event. A raincoat is needed if it is raining and the event will still go ahead even in rain! If this is the case a change of clothing will be needed for afterwards. We recommend each team takes a little first aid kit with them and the adult shadow has a mobile phone. Any medication for students should also be taken (eg. for allergies or asthma). Bring your lunch and plenty of water. Usually teams have lunch after they are finished while waiting for the prize giving. Adult shadows are required to follow the Junior Schools teams. Adult shadows are just that – a shadow for safety reasons and as frustrating as it is, they are not allowed to help the teams in any way with navigation or activities!